A treehouse in the city’s backyard. On a large leafy suburban Sydney block, our client's brief for transforming their non-descript double-brick Interwar house gave an opportunity to respond with an elevated outdoor room sitting amongst the trees. Our clients wanted to open up and connect the house to the sloping rear garden - one of the major appeals of the property - bringing a bushland setting into frame. Streamlined, family-friendly living spaces with seamless connections between indoor and outdoor, and a more sociable kitchen for entertaining, were highly desirable. The design strategy for the project was to retain the front rooms of the original dwelling, demolishing the dilapidated existing rear addition to make way for a substantial two story addition containing an array of living spaces and service rooms. A discreet stair acts as the hinging point of the new and old, with minimal disruption to the floorplan. 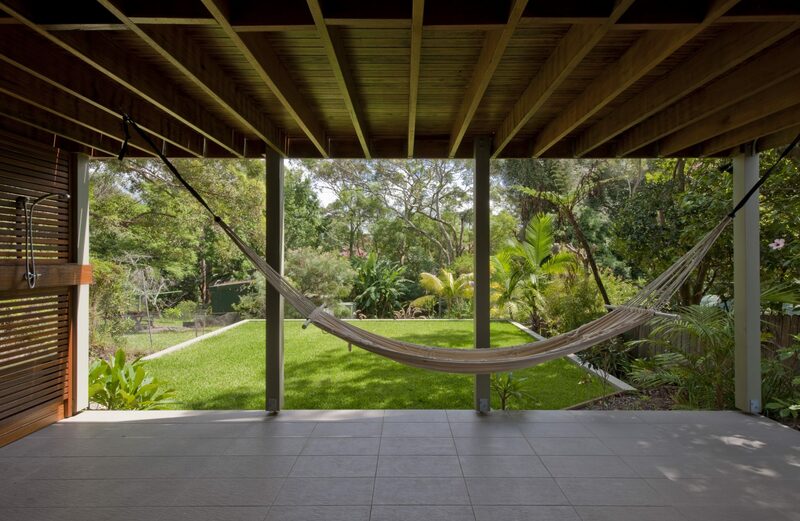 Expansive outdoor living spaces are accessed across both levels of the dwelling, a capacious timber deck marked out by slender hardwood posts that create a measure of enclosure for the covered patio stacked below. Sweeping bush views are afforded to the indoor and outdoor spaces, with the grassed terrace and rambling garden anchoring the house in the neighbourhood’s garden.